The very first piece I ever wrote and sent to in to a national magazine was after Kevin and I spent a day on the beach near Campbell River, BC. Walking along the sea wall, we found a huge blackberry bush and picked the juicy, sweet fruit until our fingers were purple-his more because he ate the berries instead of placing them in the bucket. It was a bittersweet moment that day, mostly because we had become serious about moving to California and were putting gears in motion. I went home and wrote about the sea, my blonde haired little boy, and how picking blackberries was something we loved. That piece was just the beginning of my journey into blogging when it was published. Life sure had other plans in store for us; not only did we never make it to California, but we were to move three more times until finally settling here in Chilliwack, where we never plan to leave. Kevin will legally be an adult in less than 6 months and is working in a city about three hours away. He comes home on the weekends, ready to do laundry, sleep in and be fed by his Mama-who now that she has no growing boy to cook for, rarely cooks in the giant batches that I did only 2 short years ago. Remember when I'd make huge batches of soup, biscuits, cookies, and other things all at once on a Saturday? That kind of cooking is a distant memory, now. These days it's all salads and downsized portions for only one or two, with little baking since nobody else eats it and my waistline doesn't need a bunch of cookies on a daily basis. Some days, I feel at loose ends with nobody to feed and at first it took some major adjustments. I was constantly having to re-calibrate how much to cook until now, I think I have the amounts down to where I don't need to invite half the neighborhood over for dinner. Last weekend when Kevin came home, we went berry picking out at Maan Farms. Located in Abbotsford on Vye road, we had driven by Maan farms many times with the intention to eventually stop. I had followed Maan Farms for some time on Facebook, and had read about the fantastic cafe, winery, berries, and more. We were ready to go for lunch, pick up some wine, and browse the market. Until the place burned down only days before we had planned to go. Undeterred, Maan Farms continues to sell berries and other produce from a stand in their parking lot, also offering u-pick berries-and in the spirit of supporting a local family, Kevin and I waited for the rain clouds to clear one morning and arrived at the farm, ready to pick just like the old days. 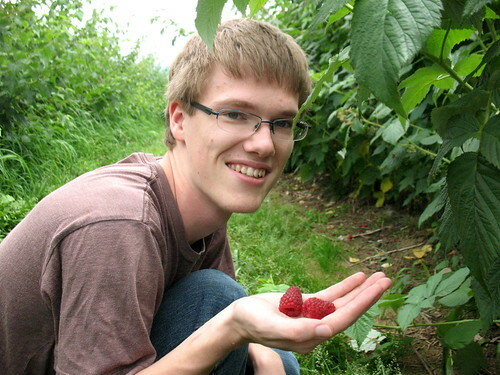 We wandered up and down long rows of berries, searching for the ripe ones, and re-living the days of when we fended off wasps, spiders, and long thorns when he was a small child. When he was around 6, he'd sit in the middle of the blackberry patch while I picked, petting and talking to Marmalade, an orange tabby cat who would come and visit us. His face and clothes would be purple from eating as many berries as his tummy would hold, the cat purring and rubbing against his knees. This time we talked and picked, catching up on his time away, his new job, what life is like for my almost adult son. We talked about hopes and dreams-his and mine, and before you know it, the box was full. This time, he didn't eat any. Okay he may have eaten a few, but they were the ones that we so ripe that they fell apart in his hand the second he touched them. "Mom, you know what's cool? It doesn't look like there's any berries here, but if you sit on the ground and just look up, there's tons. Seriously. Just look up." There they were, fat and juicy, just hiding behind the leaves out of sight-some as big as strawberries. Maan farms is open every day, selling U-Pick berries, already picked berries, and other farm produce such as corn, zucchini, and beans in their parking lot. Drop by and pick up a bit to support the family as they rebuild. 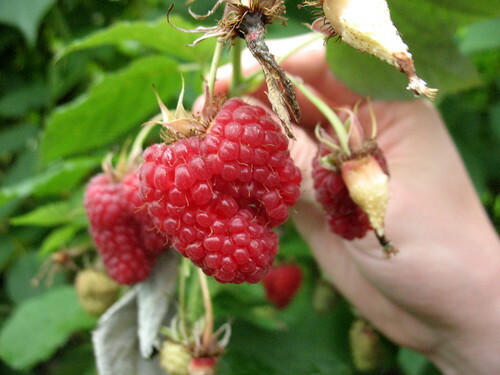 Our raspberries were SO delicious-we've been eating them by the handful, on ice cream, in smoothies, and I've tucked most of them in the freezer for another day to make into pies or jam later. Blueberries are also available! If you go, wear old shoes and clothes, you'll get a bit dirty and likely get berry juice on yourself. A water bottle and hat is helpful, as it gets very warm in the fields. Kids under 5 are subject to a $2 admission fee, likely because they will eat more than they will pick. Containers are available for $1 each, but you can also bring your own. They accept debit and there's plenty of parking. Also, there's a Starbucks not far from the farm if after picking you need a cold drink to refresh yourself again. I'm not really sure about bathrooms; there was an outhouse when we went, but it's probably best to go before you hit the fields. Above all, enjoy. Berry picking is a great way to hang out with your kids and teach them about where food comes from, and support a local family at the same time. If you can't find anything that looks good in your day, just remember what Kevin said about the berries-occasionally, the good stuff is hiding. All you have got to do is look up. Disclosure: This post is not sponsored. In fact, the folks at Maan Farms don't even know I have written it, as I put this together. I firmly believe that it's even more important to support local businesses when they suffer a loss such as this one has, and wish them well. We'll continue to visit the farm throughout the summer, and look forward to hopefully sharing better news as they rebuild!